Rick's Pocono Blog: Lakefront Friday/ Brier Crest! Located just 2.5 miles from the slopes at Big Boulder you can find the Shangri La of the Poconos. 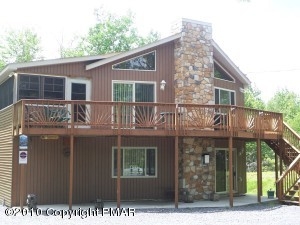 That's right, Brier Crest Woods Community and its 43 Acre Lake Shangri La can be found conveniently just off of Pa Rte 903 and very close to PA Rte 115. Homeowners of this fabulous lake community enjoy the sandy beach at Lake Shangri La, basketball courts, tennis courts and picnic and playground facilities. This community enjoys seeing an abundance of wildlife since it is predominantly surrounded by PA State Gamelands. Hundreds and hundreds of acres of wooded green space keep this community rustic and earthy. For all of you race fans Pocono Raceway is about 5-10 minutes from this relaxing Pocono Community. Now that you know a little bit about Brier Crest let me just tell you the lakefronts are beautiful. Check them out now for free!